Dancers and listening audiences alike have long enjoyed Eric’s innovative piano accompaniment, melody playing, and compositions. Eric has been a part of the Boston area music scene most of his life, and has performed throughout the Northeast at contra dances, concerts, weddings, festivals, and other events. Eric is a member of the Reiner Family Band and recently joined The Moving Violations, a contra dance band based in Western Massachusetts. The music of the Moving Violations features driving double fiddle harmonies, strong rhythm, affectionate abandon, original compositions, and occasional silliness. Eric also plays with fiddlers Julie Metcalf, Alden Robinson, David Kaynor, and Andy Reiner (his brother). Eric is the pianist for musical services at Temple Sinai in Worcester and also plays for occasional for services at his home synagogue, Temple Isaiah in Lexington. Previously, he was a founding member of Matching Orange (which performed at concerts and contra dances) and played in the Rachel Cole Band (a Jewish folk/pop/rock group). Eric has had the pleasure of playing with Cape Breton fiddler Ashley MacIsaac and Irish fiddler Tony DeMarco, and has appeared on Brian O’Donovan’s “A Celtic Sojourn” Boston Session show. In Fall of 2011, Eric made his musical theatre debut, as rehearsal pianist and co-musical director for a community production of the musical, “Prairie Lights,” which was performed in Lexington and Concord, Massachusetts. In early 2012, he worked briefly as a music curriculum consultant for Growing Well, a preschool program in Bedford. Last year, Eric published a book of his original tunes, titled Fiddle Bottle Waltz. His most recent CD, “On a Meadowlark Night: Dance Music from New England, Ireland, Scotland, Québec, and Cape Breton,” has received great reviews from Folk Roots and Celtic Beat Magazine, which praised Eric’s “superb craftsmanship on the keys.” This release features his playing along with friends and family, including fiddlers Andy Reiner, Dave Reiner, and Kimberley Fraser; hammered dulcimer player Ken Kolodner; flutist Anna Grosslein; clarinetist Billy Novick; and bass player Will Lydgate. Past performances include the Boston Celtic Music Festival, Brown University Contra Dance, Champlain Valley Folk Festival (Vermont), Club Passim in Harvard Square, Concord Scout House, Festival Mémoire et Racines (Québec), Me and Thee Coffeehouse, NEFFA, Rehoboth Contra Dance, and the Wheaton College Contra Dance (which he helped to start). Eric took up piano at age seven and has loved it ever since. Growing up, he took classical lessons in Lexington with Kimberley Howe, Sharon Timm, and Mary Nolan. At Lexington High School, Eric took jazz classes with Eric Schedin and Justin Aramati. While a student at Wheaton College in Norton, Massachusetts, Eric worked with Lisa Romanul and Ann Sears. 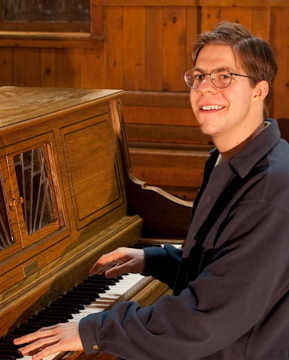 A few years after starting on piano, Eric was excited to branch out and learn to play and accompany traditional music, and had the first of many lessons with Jacqueline Schwab, pianist in Bare Necessities and on many Ken Burns PBS shows. At summer music camps, he has worked with piano greats Keith Murphy, Jeremiah McLane, and Peter Barnes (New England); Rachel Aucoin (Montréal); and Stephanie Wills and Howie MacDonald (Cape Breton). Eric got his performing start playing with his Dad, Mom, brother, and friends in the Reiner Family Band, at Upper Story Books in Lexington, when he was six years old. Other early gigs included local record and cassette shop (yes, that’s right!) Overall Music, Discovery Day in Lexington, and contra/square dances at all six Lexington public elementary schools. Before he had turned five, Eric started playing violin, inspired by the music he heard around the house from his family. He enjoyed learning Suzuki violin techniques and repertoire from Helene Kamen, and folk music from his dad, Dave Reiner. He even won the Under 11 division at the Concord, New Hampshire Fiddle Contest.